Digi-Key introduces the Inventek ISMART + Cypress PSoC 4 IoT Development Platform in their latest issue for new product alerts to all of Digi-Key’s global subscribers! Inventek’s ISMART (Inventek Systems Module Arduino Test) evaluation platform is an embedded wireless connectivity shield enabling fast time-to-market for IoT designs. The ISMART shield can host Inventek’s eS-WiFi™ embedded Serial Wi-Fi modules, powered by Cypress wireless technology, which are fully qualified/certified and offer a wide range of modular radio combinations consisting of single-band (2.4 GHz) and dual-band (2.4 GHz/5 GHZ) 802.11a/b/g/n MAC/Baseband/Radio SoCs with integrated Bluetooth 4.0. 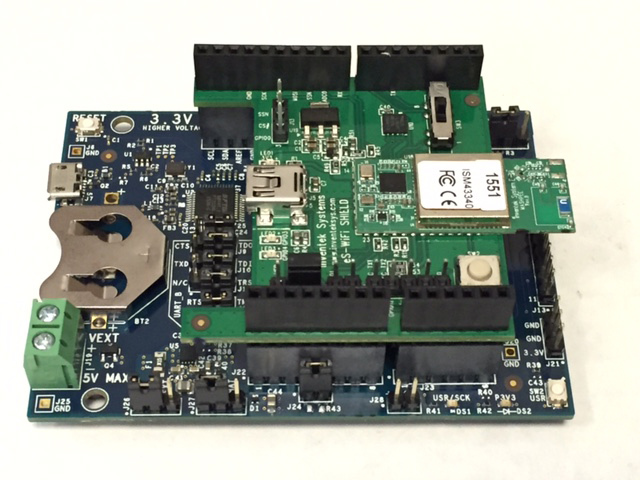 This ISMART platform allows customers to quickly launch IoT products based on Cypress’ PSoC 4 MCU Development Kits, with PSoC 4 as the host MCU. Using Inventek’s friendly AT command set firmware, IWIN (Inventek Wireless Interoperability Network), PSoC can easily communicate with the eS-WiFi modules, thus enabling Wi-Fi connectivity in a variety of IoT applications. The following documentation provides further information on the ISMART + PSoC 4 MCU IoT Development Platform setup, including complete TCP Client and AWS-Cloudbourne software configuration demos. 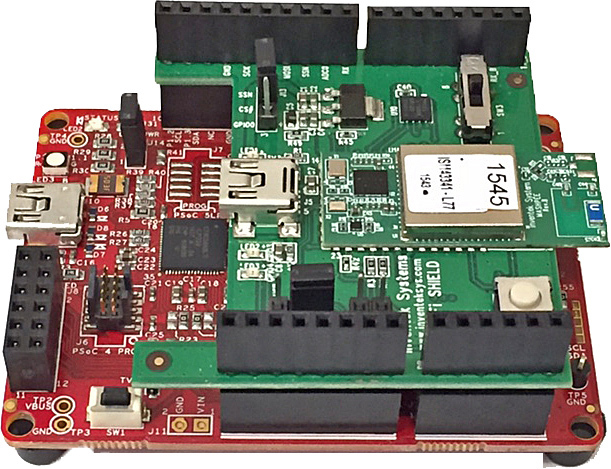 This ISMART platform allows customers to quickly launch IoT products based on Cypress’ PSoC 4 MCU Development Kits, with PSoC 4 as the host MCU. Using Inventek’s friendly AT command set firmware, IWIN (Inventek Wireless Interoperability Network), PSoC can easily communicate with the eS-WiFi modules, thus enabling Wi-Fi connectivity in a variety of IoT applications. The following documentation provides further information on the ISMART + PSoC 4 MCU IoT Development Platform setup, including complete TCP Client and AWS software configuration demos. Inventek Systems’ ISM43362-M3G-L44, 802.11 b/g/n Wi-Fi module and Inventek Systems’ IWIN proprietary connectivity SW, enables IoT applications for the ST Micro B-L475E-IOT01A Discovery kit. Users can now develop applications with direct connection to cloud servers. 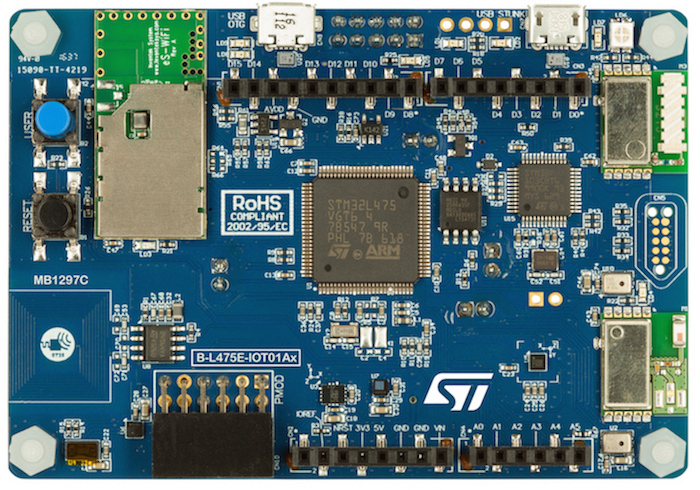 The Discovery kit enables a wide diversity of applications by exploiting low-power communication, multi-way sensing and ARM® Cortex® – M4 core-based STM32L4 Series features. Inventek and Broadcom to hold a series of IoT seminars in 2015. On the Wi-Fi side of connectivity, Broadcom also provides a full-featured Eclipse-based SDK/Development Kit. Additionally, Broadcom is leading the way with Apple MFi HomeKit ready and Universal Bluetooth Smart to WLAN combo chip designs, all of which allow the developers to create secure embedded wireless networking applications on an existing microcontroller, or on an additional WICED module that includes a microcontroller. The BCM4334X is a single–chip integrated quad radio (WLAN/BT 4.1/FM/& Near Field Communications [NFC], with integrated low noise amplifiers (LNAs) and a transmit/receive (Tx/Rx) switch which offers a level of integration that greatly reduces the external part count, PCB footprint, and overall cost of the embedded wireless solution. Broadcom has partnered with Inventek Systems, to deliver the first production modules based on the highly anticipated and very integrated BCM4334X offering. Broadcom is also working with Inventek to deliver complete turnkey hardware solutions of different form factors to readily enable Wi-Fi, BLE and NFC connectivity in system design. Inventek also offers IWIN (Inventek Wireless Interoperability Network), firmware, a very compelling and user friendly FW protocol to ensure maximum optimization and seamless integration of WICED. In addition, Inventek also provides customers Cloud-ready Agent FW, IWINC (Inventek Wireless Interoperability Network for Clouds) to enable IoT platforms to seamless connect to target Cloud Owners and/or Providers. During this session attendees will receive an overview of Broadcom’s WICED Smart and WICED Wi-Fi IoT solutions, including a glimpse into the Roadmap for these products. In addition, hands-on demos will be provided which include detailed technical discussion on both Wi-Fi and Bluetooth Low Energy software and hardware topics which affect today’s embedded IoT developer. 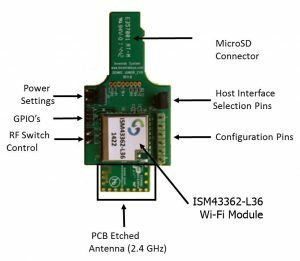 Inventek Systems announced a four function wireless combo module that provides the highest level of integration available for an IoT device. It includes a dual band 2.4 GHz and 5 GHz IEEE 802.11 a/b/g/n single stream, Bluetooth Low Energy (BLE), Bluetooth 4.0 and Near Field Communications (NFC). The module is based on Broadcom BCM43341, Quad combo IC and the radios can operate simultaneously. There is time domain multiplexing so Bluetooth and Wi-Fi are not transmitting simultaneously, although to the user it looks that way. Inventek provides Linux drivers for the following processor platforms.